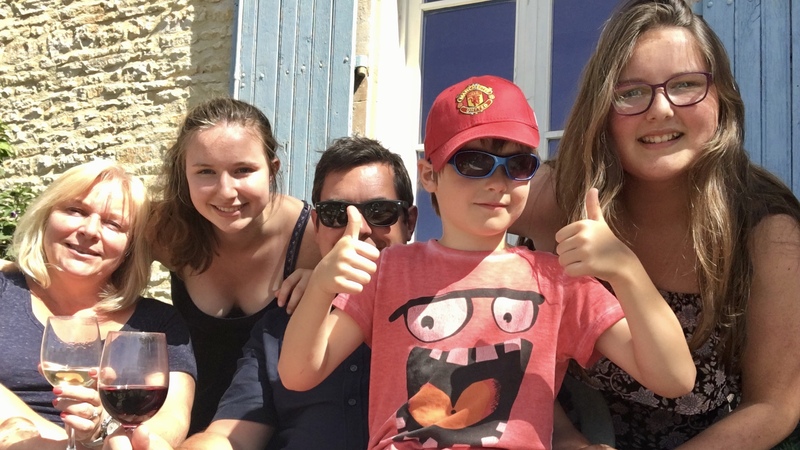 August started with a break and a family holiday in France and a reminder for me to thank Mum and Dad and my sister Grace and brother Dylan for supporting my development and training. Mum takes care of all the organisation and administration, Dad helps me at most training sessions and competitions and my brother and sister both make sacrifices in terms of time and priorities. I don’t thank them all enough for supporting my passion and development but without them I simply would not be able to to what I do, so here we all are on holidays together this summer. I missed Aslan and I missed training but I did get some exercise in the pool and the girls on the yard sent me photos of Aslan while I was away which I was very grateful of. I think I missed him more than he missed me! We had a great holiday and made some great new friends too. 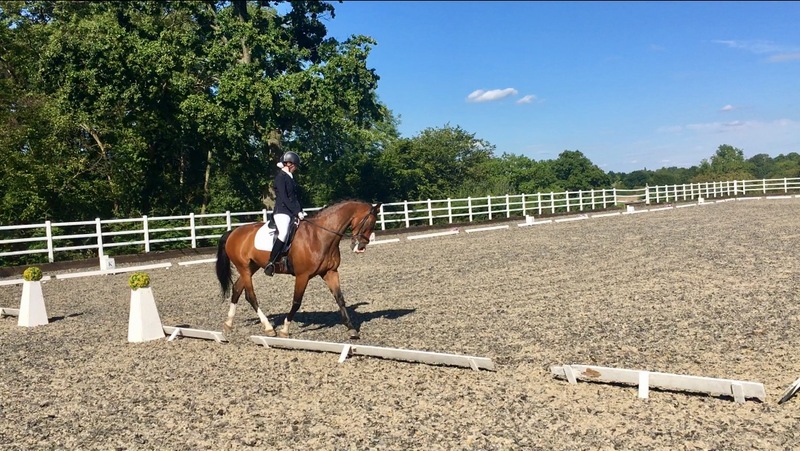 Once we were back home we were straight back into it, in preparation for the Para Festival of Dressage at Solihull. Both Aslan and I were used to Solihull as along with Vale View it is one of the preferred venues for the BEF Excel Programme squad camps. It has the benefit of being quite a bit closer to home for us than Vale View and the added advantage (according to my Dad) is that it has the best cooked breakfasts! We had a good plan in place for preparation with my coach Sacha Hamilton but had the the added challenge that the event coincided with her summer holiday, so this was the first time we were to compete a major competition without Sacha to guide us through – it was going to be just Aslan, me, Mum and Dad travelling. Mum and Dad don’t have equestrian backgrounds so its a measure of our collective development that we could even contemplate doing it on our own given that we have only had Aslan for a little over a year. If that wasn’t enough, disaster struck on the Friday as we got ready to go to the yard. Mum tripped taking out the recycling and cut her hand badly. After a bit first aid from me and a trip to hospital for Mum, it was obvious we had to reassess plans and priorities. Within twenty four hours, it was just Dad and I heading to Solihull with Aslan for the Summer Nationals. Meanwhile Mum was admitted to Stoke Mandeville for what turned out to be five hours of micro surgery to repair tendons, nerves and arteries in her damaged fingers. Mum being Mum insisted that this was no big deal and over hell and high water I was going to compete at Solihull. So while both Dad and I wanted to stay with her, we were packed off and on our way with Aslan. It was a bit odd trying to concentrate on our preparation while Mum was admitted to hospital and under a general anaesthetic, but she didn’t really give us a choice in the matter, so we just got on with it. So we got Aslan and our kit ready as planned, travelled to Solihull, settled in and got ready for a light schooling session to settle Aslan in as planned. He was a star, and did a great job of relaxing me too under the circumstances which was made all the better when I got to speak to Mum who was still a bit groggy but out of surgery and back on her ward. She was ok, and we were on track. The Summer Festival of Para Dressage is a Bronze / Silver event, so I was only able to ride the Novice Test. Sunday started with amazing sunshine and blue skies. We had opportunity for a warm up test in the morning in preparation for the main competition in he afternoon. 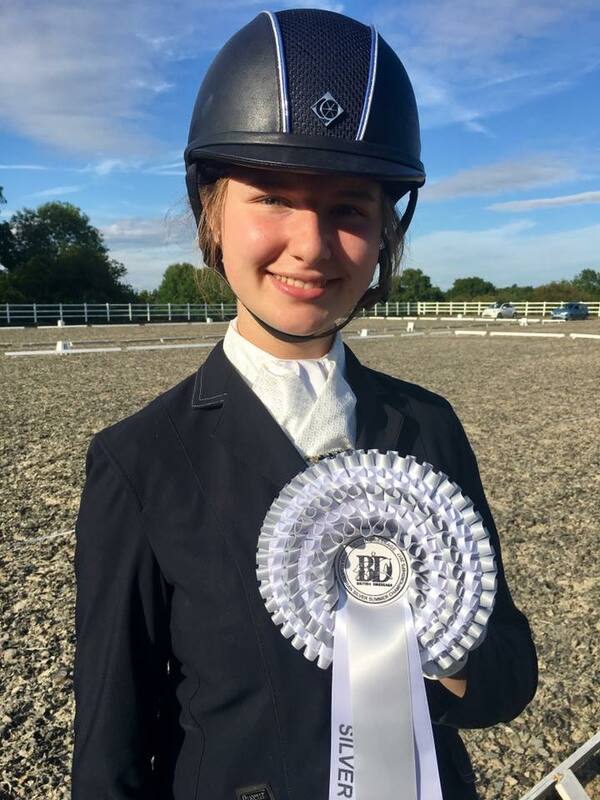 The warm up doubled as a Winter Qualifier for the the National Winters at Vale View and a remainder that the summer was all but over and that autumn and then winter was upon us. Our preparation and the warm up went well, even with just Dad to help me get ready and get us ready in a busy warm up arena. I probably heaped a lot of pressure on myself as more than anything I wanted to do well for Mum to cheer her up. She was still in hospital, but getting over the surgery and I was able to talk to her before the test. 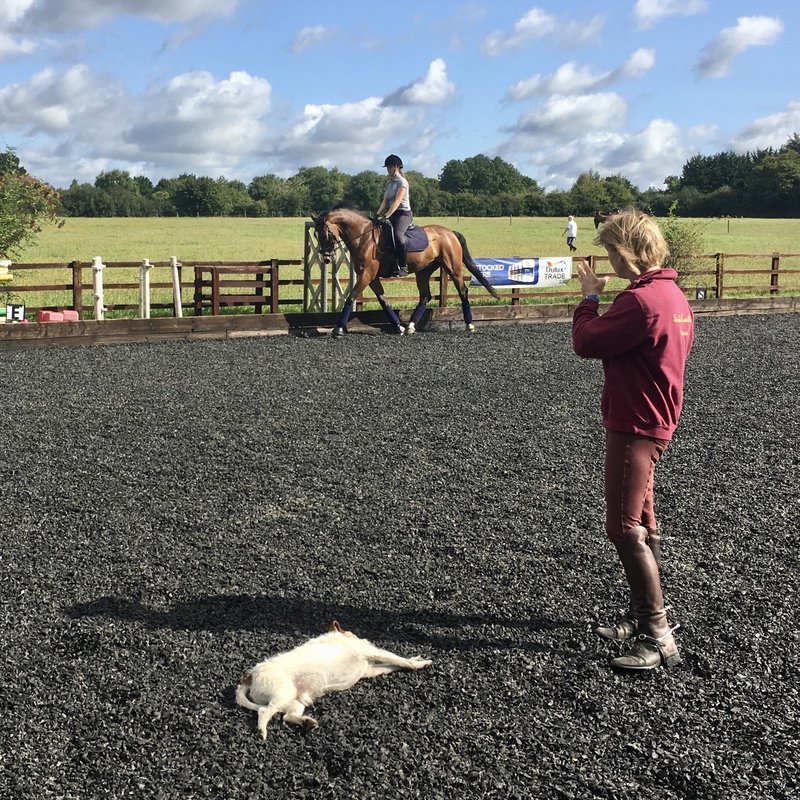 The test itself was in the outside school, and while we had trained at Solihull before with Excel we had never competed there, either indoor or out so yet another first just us. We were all set and after checks with the steward we were set to go. Aslan calmly trotted past the judges parked in their cars, the bell went and we were off. We had a good start, with Aslan finding his rhythm, but approaching the half 10M circle back to the track Aslan saw something scary off to the right and spooked left in a fairly major way. He immediately got on with it but it I could tell he was still a bit nervous which showed on our canter circle in the same part of the school, I could feel him tightening and getting on his toes even in the walk. By the right right rein canter down the same spookey side he was very tense showed it by breaking into canter on our final medium and by the time we were down the centre line I think we were both ready to finish. After a salute and a pat for him to calming down I had a “well ridden and staying on” from the judge as I passed her to head out, but a 63.79% was not what we really wanted in the circumstances. So as sometimes happens it can feel like a warm up test puts you backwards rather than forwards, but at least we’d been in there and Aslan knew what to expect. In the afternoon it was the real deal and we were back into the warm up arena in preparation for the Summer Nationals test. Aslan was brave and much more settled this time around which resulted in a far smoother and far netter test when it mattered which resulted in a championship competition personal best score of 66.03% and third place at in the Silver Championship. If we hadn’t been quite so enthusiastic into our second canter transition it might have been a bit better and while it wasn’t a first place and red rosette it was pretty good in the circumstances with just me and Dad there. And that pretty much rounded off the 2017 season. Right at the end of the month we submitted our application for the next new British Equestrian Federation Excel Talent Development Programme cohort 2017/19 which I will have to ride a selection trial for this time around if I get asked next month, so we’re not quite done for the year, then hopefully selection, squad training and Winter Qualifiers and the beginning of our Individual Test development over the winter. Thanks for reading and I hope you come back next month to find out how we did!